I usually have lots and lots of dinner ideas, like too many for my mind to hold that if I don’t write it down I will forget about it. Then there are some nights, where I am drawing a blank, I can’t think of anything and I am not in the mood for any ideas I have written down. This is when I usually turn to my sister. I just text her “dinner” and she shoots back all kinds of ideas for me. It is usually more classic food and on nights like these, that’s what speaks to me. She’ll text “burritos, tuna casserole, tacos, chicken fajita, etc.” Tonight was that kind of night and one of her ideas made me excited: chicken pot pie. 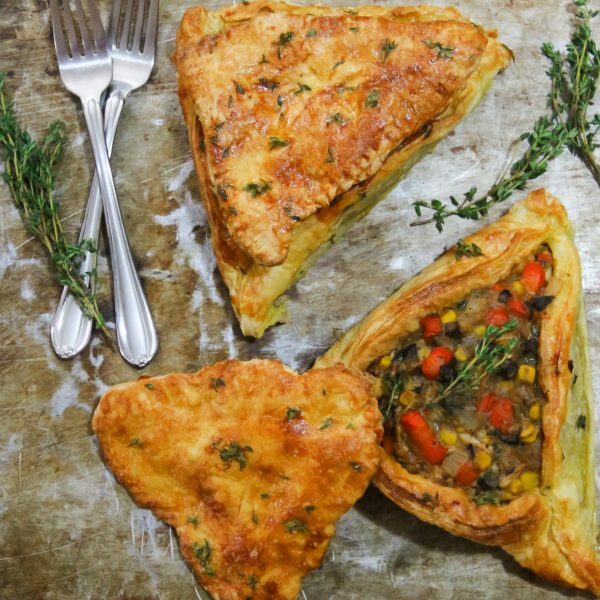 Now Purim is almost here and as I saw the words chicken pot pie, I immediately thought why not in a hamantasch? It has got all the layers and right now it’s in a circle so how hard could it be to make it a triangle! And it wasn’t! While it took some creativity to get it to stay in a triangle shape as I don’t own a pie dish in that shape (now that would be helpful!) it was overall really easy to make and it was the perfect dinner for a night like this. It was homey and comforting which is what I was looking for, but also creative, so it is a win in my book. Definitely, try this for your Purim Seudah, your guests are sure to be impressed. Season the chicken with salt and pepper. In a large skillet over medium-high heat, add 1 tablespoon of olive oil and cook the chicken until golden brown, about 3 minutes per side. Add a splash of water to skillet. Cover, reduce heat, and cook until chicken is cooked through, 10–12 minutes. Transfer to a plate. In the same skillet from the chicken, sauté the onions, leeks and garlic in olive oil on medium-low heat until golden, around 10 minutes. Add the carrots and mushrooms and continue to sauté until tender, around 5 minutes. Add in the corn. Sprinkle the flour over the vegetables and continue to sauté for 2 minutes. Add the chicken stock and stir. In a small bowl, mix cornstarch with 1 tablespoon of water and add to the saucepan. Simmer, stirring occasionally, until thickened, 5–7 minutes. Stir in the diced chicken, thyme, sage, salt and pepper. Meanwhile unfold the pastry dough onto a lightly floured surface. You don't need to roll it out because it needs to stay thick but with your fingers work the crease so that it's one big square and doesn't have creases anymore . Using a 9-10" dinner plate as a reference, cut one big circle from each sheet using a sharp knife. Bunch some tin foil or parchment paper into a ball, spray cooking spray all over, and place in center of circle and fold the dough over to form a triangle as you would a normal hamantaschen. Make sure to really close up the seams because you can't have it open up. Gather all the scraps leftover from the circles and form four flat triangles the size of your hamantaschen opening that you can use for a cover or roll it out and make a fifth circle for another hamantaschen. 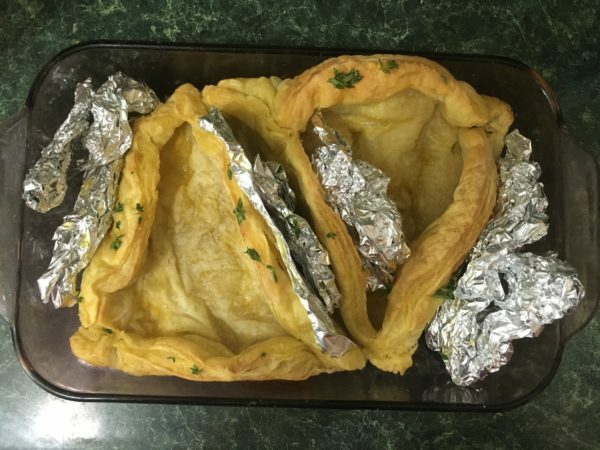 Spray a rectangular baking dish with cooking spray and place your hamantaschen in using more tin foil around it to keep it upright (make sure to spray cooking spray onto any tinfoil touching the dough so it won't get stuck). Once your hamantaschen shapes are secure, place in the oven for 20-25 minutes until dough is slightly golden and can hold its shape without the tin foil, but leave tin foil in until ready to fill with chicken. Remove the foil from inside the hamantaschen shapes, but leave any tinfoil you used to support from the outside. Ladle the chicken filling into the triangles. Brush each hamantaschen with the egg wash and sprinkle on fresh thyme. If your making the triangle covers, use the back of a fork to crimp the edges of the dough. Cut a few vents in the middle and brush with the egg wash and sprinkle cut up thyme. Place onto a baking sheet and bake everything until crust is golden brown, around 20-25 minutes. Let pie cool slightly before serving.